STEVENSON is pleased to present Space minding, the first solo exhibition by Olafur Eliasson to take place in South Africa. Eliasson is a Danish-Icelandic artist known for sculptures and large-scale installation artworks that employ elemental materials such as light, water and earth. In 1997, he participated in the second Johannesburg Biennale with the urban intervention Erosion, in which he turned a water reservoir into a running stream that stretched 1.5 kilometres through the city. 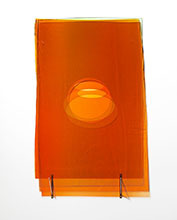 At Stevenson, Eliasson will present a group of works focused on light. 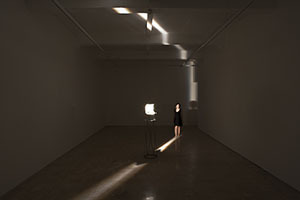 Mono scanner (2004) consists of a cylindrical Fresnel lens, mounted horizontally on a rotating pedestal, which casts a single, narrow beam of light onto the floor, walls and ceiling of a room. As the lens rotates around the horizontal axis, the vertically oriented band of light sweeps slowly across the surfaces of the room, giving the impression that the band of light is emitted from the lens not as a disc but in the shape of the room's rectangular cross-section. A single rotation takes approximately one minute and 30 seconds. 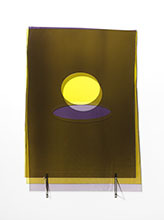 In a second room, he will exhibit works from his Polar fall fade series: each consists of three coloured glass panes, supported on a wall rack, with a different elliptical cut-out in each pane. The overlapping ellipses create a variety of colour saturations and tones. Hand-blown by artisans in one of the few remaining glassworks capable of producing sheets of this quality and size, the glass exhibits visible bubbles and variations throughout. The works extend the artist's interest in creating pigments and visual effects through the superimposition of coloured, transparent layers. The visitor oscillates between viewing the piece head-on, gaining the complete colour spectrum of the combined panes, and from the side, revealing the depth and construction of the layers. In this oscillation, the focus fades from the colours to the objects that produce them and then back to the colours. 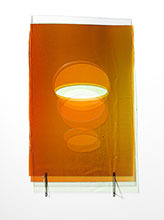 Eliasson was born in 1967 and lives and works in Copenhagen and Berlin. He grew up in Iceland and Denmark and studied, from 1989 to 1995, at the Royal Danish Academy of Fine Arts. In 1995, he moved to Berlin and founded Studio Olafur Eliasson, which today encompasses some 75 craftsmen, specialised technicians, architects, archivists, administrators, programmers, art historians and cooks. Since the mid-1990s, Eliasson has realised numerous major exhibitions and projects around the world. In 2003, he represented Denmark at the 50th Venice Biennale, with The blind pavilion, and, later that year, he installed The weather project at Tate Modern's Turbine Hall, London. Take your time: Olafur Eliasson, a survey exhibition organised by the San Francisco Museum of Modern Art in 2007, travelled until 2010 to various venues, including the Museum of Modern Art, New York. Innen Stadt Aussen (Inner City Out), at Martin-Gropius-Bau in 2010, involved interventions across Berlin as well as in the museum. Similarly, in 2011, Seu corpo da obra (Your body of work) engaged with three institutions around São Paulo and spread out into the city itself. In 2014, for Riverbed, Eliasson filled an entire wing of the Louisiana Museum of Modern Art, in Denmark, with stones and water to emulate a river meandering through a rocky landscape. In December 2014, Eliasson opened the first exhibition at the newly built Fondation Louis Vuitton in Paris. Eliasson's projects in public space include Green river, carried out in various cities between 1998 and 2001, and the Serpentine Gallery Pavilion 2007, designed together with Kjetil Thorsen. The New York City Waterfalls, commissioned by Public Art Fund, were installed on Manhattan and Brooklyn shorelines during summer 2008. Your rainbow panorama, a 150-metre circular, coloured-glass walkway situated on top of ARoS Museum in Aarhus, Denmark, opened in 2011, and Harpa Reykjavik Concert Hall and Conference Centre, for which Eliasson created the facades in collaboration with Henning Larsen Architects, was completed that same year. 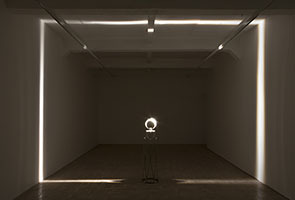 As a professor at the Berlin University of the Arts, Eliasson founded and led the Institut für Raumexperimente (Institute for Spatial Experiments, 2009-14), a five-year experimental programme in arts education located in the same building as his studio (www.raumexperimente.net). In 2012, Eliasson and engineer Frederik Ottesen founded Little Sun. This social business and global project provides clean, affordable light to communities without access to electricity; encourages sustainable development through sales of the Little Sun solar-powered lamp, designed by Eliasson and Ottesen; and raises global awareness of the need for equal access to energy and light (www.littlesun.com). 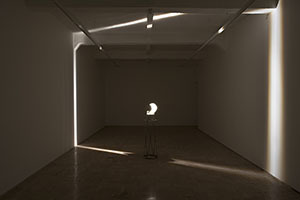 Eliasson exhibits concurrently with Kemang Wa Lehulere.